Today is World Alzheimer’s Day which is helping to raise awareness of the global effects of Alzheimer’s and Dementia. According to Alzeheimer’s Society there are around 800,000 people living with Dementia in the UK, and around 40,000 of these are younger people. By delaying the onset of dementia by five years, the number of deaths related directly to dementia by 30,000 a year. There have been several prospective studies that have looked into the effects that keeping active and living a healthy lifestyle can have on reducing the risk of dementia. The results of 11 different studies show evidence that regular physical exercise reduces risk of dementia by 30 per cent, and for Alzheimer’s disease that increases to 45 per cent. Despite these findings, other research by the Alzheimer’s Society shows that 64 per cent of Britons are not aware that exercise could help to lower the risk of dementia, and almost four out of five people are not doing the recommended amount of exercise set out by in NHS Guidelines. A literature review also found that there is a clear link between cognitive performances of people over 60 years of age and physical activity. Out of 27 studies looked at during the review, 26 suggest that exercise might help to reduce cognitive decline in later life. The ASA launched our Dementia Friendly Swimming Project in February of this year to help enhance the experience of people living with dementia and their carers. Aerobic exercise, but swimming in particular because it is a low impact exercise, can improve the quality of life for people with dementia, reducing anxiety, improve mood and enhance psychological wellbeing, as well as the other benefits from the Alzheimer’s Society research. 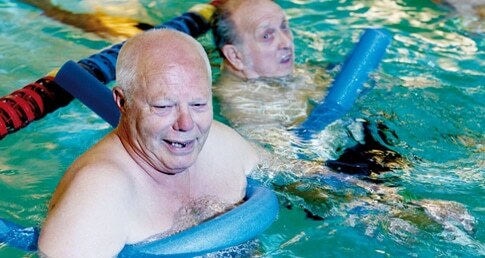 For more information about the ASA Dementia Friendly Swimming Project, click here. If you would like to find your local pool, check out our PoolFinder tool.